Mayors of Detroit have had a unique way of measuring success: By the number of homes they’ve torn down. One of former Mayor Dave Bing’s signature programs was his pledge to demolish 10,000 homes. When his successor, Mike Duggan, hit that goal last year, he hosted a celebration complete with a sign reading “10,000” on the west side home that was razed. Duggan has demolished about 11,500 homes and wants to raze another 2,000 to 4,000 per year, making it the nation’s largest blight-removal program. The city has received more than $250 million for the effort from the federal government’s Hardest Hit Fund of the Troubled Asset Relief Program and through Michigan State Housing Development Authority. Demolitions are popular among neighbors in a city that’s lost more than 1 million residents in 60 years, and where blighted and burned homes can remain nuisances for decades. But demolitions are also controversial. The Hardest Hit Fund was created to provide mortgage relief to help homeowners who owed more than their homes were worth after the 2008 housing collapse. Steering money toward demolitions denied to it underwater homeowners. And Duggan’s program is the focus of multiple investigations. The federal government has filed subpoenas into bidding practices and demolition costs. A separate grand jury has reportedly subpoenaed as many as 30 contractors and city agencies (Duggan says he’s not a target). State officials are advocating fines because contractors mishandled asbestos from razed homes. 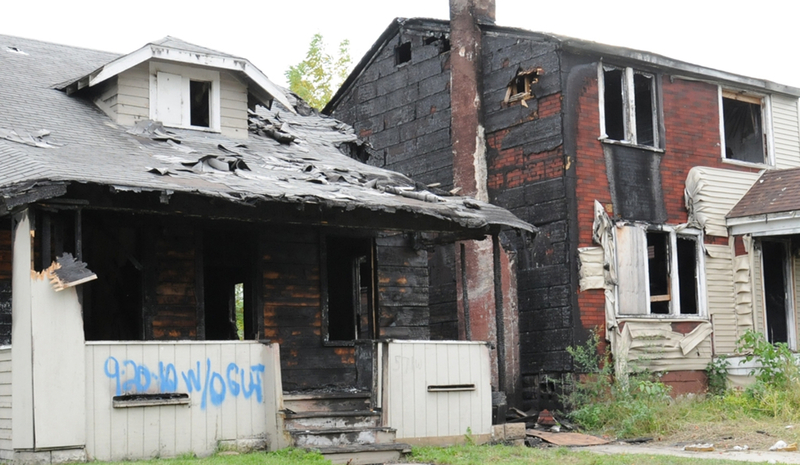 What’s more, a recent blight survey by Loveland Technologies, a private company that maps the city, questions whether demolition is even keeping pace with blight in Detroit. Vacancies in neighborhoods targeted for demolition have actually increased 64 percent in four years, the survey found. That begs the question: Do demolitions work? After decades and tens of millions of dollars spent on home demolition in Detroit, are neighborhoods any better? Could there be another way? Bridge Magazine posed the questions to two land-use scholars who’ve studied Detroit: Jason Hackworth, a professor of planning and geography at the University of Toronto, and Alan Mallach, a senior fellow at the Center for Community Progress, a Flint-based nonprofit that studies urban issues. Hackworth argues Detroit has little to show for all its demolitions. Mallach says razing homes can stabilize neighborhoods. Click on the links below to hear both sides of the demolition debate. The first problem is that all concerned, including the author of the article, see this as a top down things and money solution. They fail to understand it is a people solution. Have they even thought about why and how Detroit or any community develops, it is the people and what they want and what they are willing to invest their precious treasure of time and tears into building, into the future they want. No one in Detroit or those wanting to impact Detroit is listening to the people, those living and working there or those who might want to live and work there. They are even asking the question as to why people live and invest in communities, and they surely aren’t talking to the right people. The reality is that no matter what is spent, what is torn down, even what is built in its stead, what is Detroit or any similar community will not improve unless the people care, are committed, take ownership and all that entails. It is much like the student that graduates but never studied, they are touted as being educated but they never did what was necessary to learn and if they never learned they never controlled their future. The saddest things in all of this is that nobody is learning, whether it be at City Hall, Lansing, Washington, in the 'ivory towers' of our educational institutions or the individuals that want better for others, they all keep doing the same things expecting different results. Their only hope is that the infinite monkey theorem, 'a million monkeys [spending billions] typing on a million keyboards' will somehow type a Shakespearean play [will change the results that are happening]. It is the things people do everyday for themselves and those around them that make a community. In reality, the more they put into what they have where they live the more they will work to make it succeed. All we hear in this article is how other people spending other people’s money are going to create a new community for people in Detroit or any other community they don’t live in. We should be looking for policies and practices that will end the practice of private property abandonment which shifts the social, economic and environmental cost of cleanup to the general public.